The teenager was one of five people shot in the capital over the bank holiday weekend. Home Secretary Sajid Javid said serious violence was "robbing too many young people of their futures". In Wealdstone, three people, including two boys aged 13 and 15, were injured, and a 22-year-old was shot in Lewisham. The 13-year-old was believed to be an "innocent bystander", police said. None of them has injuries which are considered to be life-threatening. Scotland Yard said the victim - who is in a stable condition in hospital - was thought to have been attacked after questioning the driving of the suspect, who then drove away. 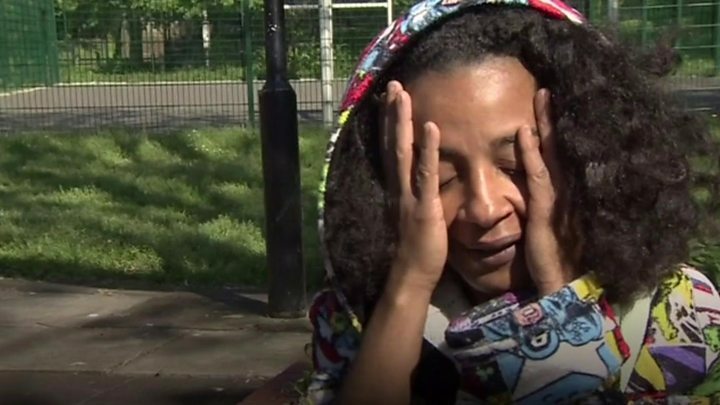 Media captionPretana Morgan, Rhyhiem Ainsworth Barton's mother: "Please just stop it now"
London Mayor Sadiq Khan said he refused to accept that nothing can be done to stem the "appalling rise of violent crime". 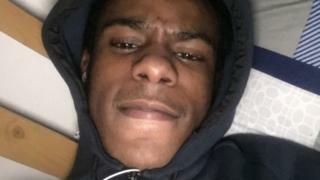 Rhyheim's death came less than 24 hours before two other teenage boys were shot on Sunday on a street in north-west London. A 13-year-old boy suffered a shotgun pellet wound to the head and was later discharged from hospital. A 15-year-old was also injured in a gun attack and remains in hospital being treated for a head injury. Police said a third victim was also hit in the arm, but has not come forward. Harrow Borough Commander Det Ch Supt Simon Rose added: "This was a callous, reckless and brazen act, without any thought by those responsible for the fact that there were families with children and people in the high street enjoying their weekend. "This was quite simply, appalling." A 39-year-old man was arrested on Sunday and has now been released under investigation. The BBC's home affairs correspondent Danny Shaw said the Met could take short-term measures, such as increasing the number of officers on patrol and using stop and search powers, to deter people carrying weapons. However, he said, it would be down to politicians and community leaders to tackle the longer-term issue of violence on the capital's streets. A 20-year-old man, who was stabbed in Liverpool city centre early on Sunday, has been named as Fatah Warsame, from Cardiff. Another victim, also aged 20, was killed in Bishopscote Road in Luton on Sunday evening. Criminologist Anthony Gunter, from the University of East London, said the government didn't "have a real handle or understanding of what's going on and what to do about it". Former gang member Darryl Laycock, who has been shot on three occasions and stabbed seven times, said he lost more than 30 of his friends to gun crime. His work includes trying to divert young people away from street violence. He told BBC Radio 5 Live more money should be invested in youth centres to give children something to do "so they're not on the street getting mixed up in postcode wars".